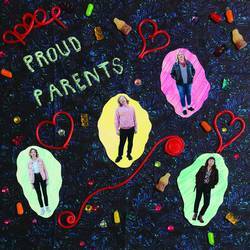 With three singers among the four familiar faces of Proud Parents, isn’t no surprise that the record succeeds on the band members’ ability to meet in the middle between different tones and styles. While the vocals due shift frequently on this self-titled debut, the music itself falls consistently in the jangly power-pop world. Members of the group also play with (or have played with) Fire Heads, The Hussy, and more. This project is something of a blender of power-pop with accenting sounds, pulling influence from ‘60s pop, a touch of surf and pysch rock, indie and a few suggestive lo-fi moments. While the tone depends on who is at the microphone, each song here is built around a melodic, jangly, and uplifting base. At times the singers harmonize, such as in “Take My Hand” and, at others, they utilize vocal tradeoffs. The positive earnest nature of the songs is what sets them apart. This album has a lo-fi charm (but complete production) that connects whereas many jangle-pop bands feel unnecessarily pretentious. There is no winking “look at how clever we are” feel to this at all. It’s accessible and welcoming. “2 Fast 2 Serious” and “Something to Talk About” are dreamy and soothing, while “Flavordust” is more of a rhythm-dominant rocker with a big groovy hook. There are occasional whoa-oh moments, turning the sing-song element up another notch. Songs like “T Street Shuffle” and “Dead Wrong” showcase where those pop elements and jangly guitars come together at their best. The tempo is usually upbeat without being aggressive. The majority of the tracks are bouncy while a few dip their toes into the dreamy realm. While that aesthetic defines the record, it’s the musicianship and vocal interaction that makes it a success. From the emphatic emotions on display in “Stuck” to the more pop-minded singsong of “Baby,” the songs are tight and well-constructed while still short and to the point. It’s a coming together of likeminded artists where each member showcases their voice without any bloat. It’s the softer side of rock ‘n’ roll, contained without being tamed. Posted Sept. 3, 2018, 10:29 p.m.
Posted May 6, 2018, 12:27 p.m.